What Are the Benefits of Watermelon for Circulation? Watermelons may relax blood vessels, improving circulation and even improving libido and erectile function, according to Medical News Today. Watermelon gives you a sweet treat with nutrients that benefit your body. Watermelon's citrulline converts into arginine, an amino acid that benefits the heart and circulatory system. Watermelon and fresh watermelon juice contain more lycopene and beta carotene than tomatoes and tomato juice do. Dark red watermelons are particularly rich in these protective phytonutrients. Phytonutrients are natural plant compounds that trigger positive health effects in the body. A 1/2 cup of diced watermelon contains only 25 calories and 6 grams of carbs, with no fat and no sodium, according to the Centers for Disease Control and Prevention. It supplies 10 percent of your daily vitamin C and 8 percent of vitamin A, based on a 2,000-calorie diet. Vitamins C and A are antioxidants that protect your cells from damage. Preliminary research suggests lycopene has an effect on the carotid artery's thickness and may help to prevent cardiovascular disease by protecting LDL, "good" cholesterol, from oxidation, according to Ronald Ross Watson and Victor R. Preedy's "Nutrition and Heart Disease: Causation and Prevention." High concentrations of lycopene in body fat are associated with lower rates of heart attack, especially in nonsmoking men, the authors report. Protecting your heart's health is crucial to maintaining good circulation. Oxidation of LDL refers to negative changes in LDL that may lead to heart disease. Consuming watermelon juice increases lycopene more than consuming tomato juice does. 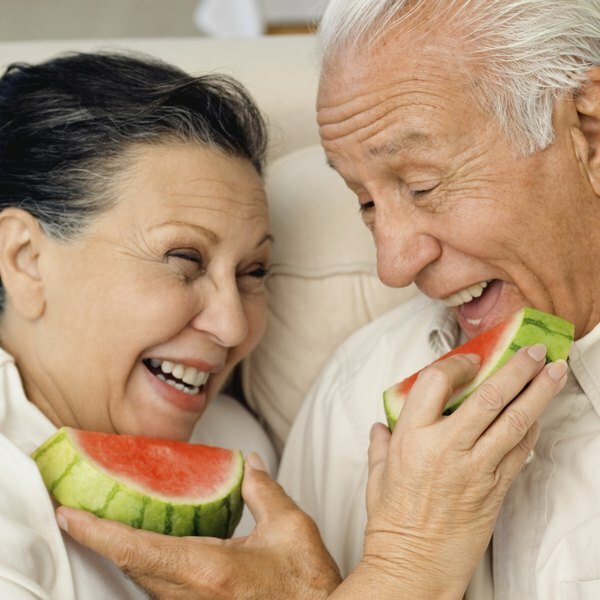 Watermelon and other foods rich in antioxidants help prevent LDL oxidation and the risk of atherosclerosis, hardening of the arteries that causes dangerous problems with circulation, the authors say. Watermelon extract reduced blood pressure in obese, middle-aged people who had prehypertension or hypertension, according to American researchers who reported their findings in the June 2012 issue of the "American Journal of Hypertension." The researchers concluded that the results suggest watermelon extract reduced arterial pressure, although further research is needed. Most of the study subjects were obese, post-menopausal women with mild high blood pressure. Even though watermelon is sweet, it has a low glycemic load. Glycemic load considers the amount of carbohydrate per serving, offering a more accurate gauge of a food's impact on blood sugar than the glycemic index alone does. Never attempt to self-diagnose or self-treat a health problem. Talk to your doctor about any medical concerns. Delaying appropriate treatment for a heart or circulation problem can have serious consequences. Harvard School of Public Health: What Is the Difference Between the Glycemic Index and Glycemic Load? What Organ of the Body Does Papaya Benefit? Does Pomegranate Juice Clean Your Arteries?